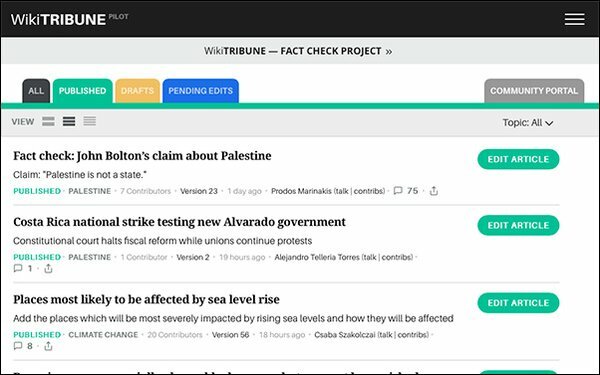 Back in May, Wikipedia founder Jimmy Wales announced a relaunch of his experimental for-profit journalist and citizen run news site WikiTribune. Wales stated he wanted to create a new type of citizen journalism, one that would see active participation from the public. But within the past few weeks, the outlet announced a major restructuring that resulted in the layoff of its entire staff of journalists. The new plan is to hire paid journalists who are better versed in wiki culture and fact-checking. From the description, it sounds like WikiTribune is going to let the public write the stories, then have their pros vet them. Along with a slew of other organizations and outlets, WikiTribune was imagined as a place where journalists and the public could collaborate on high-quality journalism, reinstilling trust in an institution that has been viewed as less reliable in recent years. WikiTribune was launched following a crowd-funding campaign to hire reporters at the site. The outfit is now doubling down on the citizen side of its journalism. According to a report by The Nieman Lab, recent public participation on the site was negligible with only 22 of its 553 members logged in at one point earlier this week. The site did record a spike after announcing its members would have greater part in editing stories. This new direction may prove sustainable for its subscriber-base. While the site’s experiment was once one focused on collaboration, it is becoming a wiki, where the public can share, add to and edit stories, much like Wikipedia itself. That doesn’t mean the experiment has failed, but may be evolving into a new kind of journalism.